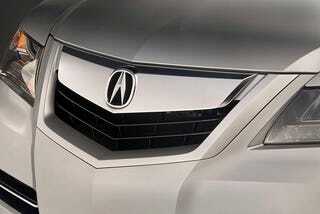 UPDATE: More details on the 2009 TL are seeing the light of day, including spy photos of the new Acura TL. The regular 2009 TL sedan will inherit the 3.5-liter V6 under the hood of the current TL Type-S. That motor puts out 286 HP now however, we expect this V6 to be tuned up to just over 300 horses when it finds its new home in the 2009 TL's engine compartment. Initially that news has us just plain giddy — however, all that horsepower will be heading torque-spinningly straight to the front wheels. Frankly, that has us a little worried. For now we'll just hold out hope Acura has invented an insanely great torque management system. The much more exciting news lies in the next generation TL Type-S. Under the hood you will find the 3.7-liter V6 from the MDX CUV. That's an engine already rated at 300 HP in the MDX and our industry sources tell us to expect this motor to be good for around 330 HP in the TL's hot rod version. That said, we've also heard whispers that a number in the 340-350 HP range is not totally out of the realm of possibility. If those horsepower numbers get your blood flowing, remember that power will also be coursing through Acura's torque-vectoring, SH-AWD system on the Type-S. That leads us to hope those rumors about a number closer to 350 HP turn out to be true. The last bit of good news on the Type-S is the slush box. A 6 speed, manumatic DSG gearbox will be standard equipment on this faster-than-average sports sedan. Expect to be able to shift the gears through steering wheel-mounted, flappy-paddle shifters, or with the "stick" itself via a "+/-" gate. Watch for the regular 2009 TL to go on sale during the summer or fall of 2008 and we expect the meaner S-Type following 6-12 months later.